Here’s a comparison of the Nomad and the Shapeoko 3. The Nomad is better in terms of rigidity, accuracy, and ease of use. The Nomad 883 Pro is a turnkey CNC machine that’s intended for people who want to make high quality parts with no fussing around. The machine comes ready to run with everything you need. Just add a Windows or Mac computer. Most people are usually up and running within an hour of opening the box. See the details page here for even more information! 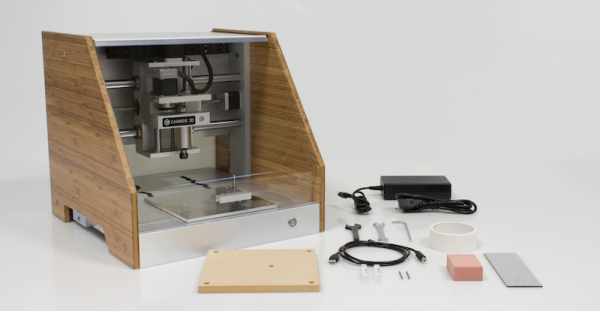 The Shapeoko is a kit that is meant to be assembled and then used in a shop environment where its noise (from the trim router) and mess (from no enclosure) wouldn’t be a problem. The Shapeoko has a larger work area (4× compared to Nomad) but compared to Nomad isn’t as accurate (0.005″ vs 0.001″). We really see the Shapeoko as a machine you’d put in your shop and the Nomad as a machine you’d put in your office or studio. Carbide Create, a full featured 2.5D CAD/CAM program comes standard with both machines. So you can draw and create toolpaths for all of our projects OR import DXF files you create in other CAD software, or SVG files from vector drawing. A license of MeshCAM comes standard with each Nomad 883. MeshCAM is a full featured 3D CAM that gives you great toolpaths with little effort. Just import an STL file and MeshCAM will take care of the rest.